Istatic.eshopcomp.com is the PUP that uses misleading techniques to prevent removal. Use Reimage to locate malicious components and get rid of them faster than with uninstall instructions. A full system scan blocks virus reappearance and prevents traffic to malicious domains. Istatic.eshopcomp.com is an ad server that supplies web advertisements. You will start to get hundreds of ads from this web page if you install eshopcomp adware on your computer. It is a potentially unwanted program (PUP), spread along with other free computer applications. If you install a free program that includes an executive file of this dubious adware, soon enough annoying ads will start to appear in new browser windows or tabs. Usually, the adware addresses hxxps://istatic.eshopcomp.com/staticFiles/DealsSearch.html?partid domain before redirecting the victim to a particular third-party offer. Some of these ads will provide splendidly looking shopping deals, freebies, services, coupons, price comparisons or even adult-only content. You may also be invited to sign up for memberships on websites you have never heard about. You might also encounter offers to install free programs, browser toolbars or software updates. You should reject all these proposals without a hesitation, and NOT click on them because they are untrustworthy. Take not that adware which monitors this ad server was created for affiliate marketing purposes, and its sole purpose is to advertise its partners and their websites. Therefore, an immediate Istatic.eshopcomp.com removal is highly recommended. Take note that you might be redirected to sites that are not related to the ad that you clicked on in any way. Some of these websites can be dangerous and promote infectious downloads, so if you want to keep your computer safe, make sure you do not agree to install any content from them, especially fake software updates (Java, Flash Player, etc.). Despite the fact that the majority of eshopcomp.com ads look extremely catchy and might seem useful, do not count on them. Clicking them can unexpectedly lead you to suspicious Internet sites. Instead, check out the guide on how to remove eshopcomp which we provided below. If you see pop-up ads that come from the aforementioned website, you can also opt for automatic adware removal method and eliminate the described program extremely fast. Just scan your computer with a powerful anti-spyware program (for instance, Reimage) and remove Istatic.eshopcomp.com PUP automatically. In a nutshell, PUPs are distributed together with other free programs. Your agreements to install them are nicely hidden under Default and Standard installation settings because the majority of computer users tend to think these are the safe options. Dieviren.de team says that such belief is still popular among computer users nowadays. That is a big mistake; if you want to be sure if the program you want to install is reliable and also whether it contains additional applications or not, you should opt for Custom or Advanced settings and deselect the pre-selected agreements to install them along with your selected software. 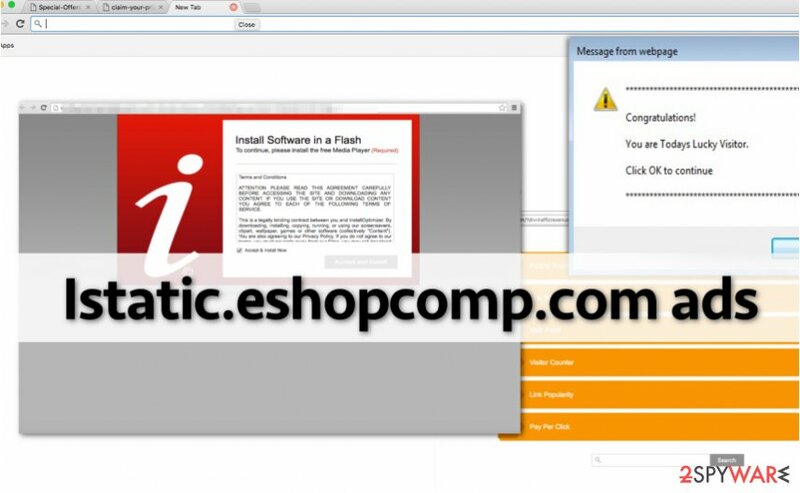 You can find instructions how to remove Istatic.eshopcomp.com virus manually below this article. Take your time, study them with caution and do everything as instructed. We are sure you do not want to leave any components of the suspicious adware on your system. If this adware has slithered into your computer, we assume that you do not have a good computer security software installed on your computer. Therefore, we recommend you to protect your PC with a strong anti-spyware software. Adware is a low-level computer threat, and it is not very dangerous; however, there are many malicious computer threats in the wild nowadays that can destroy files on your system, leaving no hope to recover them. Therefore, good computer protection should be a matter of utmost importance nowadays. 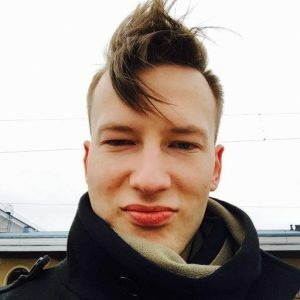 If you choose to complete automatic Istatic.eshopcomp.com removal, keep in mind that you will have a chance to remove all other dangerous software from your computer at the same time. First of all, delete every suspicious program from your Windows PC using the instructions provided below. Then fix browser shortcuts using the tutorial provided below. You can also try to search for associated keys in Windows registry, although you have to be extremely experienced to manage this panel properly. Otherwise, you might create even more problems to your computer. Use Control + F command to find and delete keys associated with Istatic.eshopcomp.com. Here, look for Istatic.eshopcomp.com or any other recently installed suspicious programs. Wait until you see Applications folder and look for Istatic.eshopcomp.com or any other suspicious programs on it. Now right click on every of such entries and select Move to Trash. When in the new window, check Delete personal settings and select Reset again to complete Istatic.eshopcomp.com removal. Once these steps are finished, Istatic.eshopcomp.com should be removed from your Microsoft Edge browser. Refresh Firefox to revert browser's settings back to default. Here, select Istatic.eshopcomp.com and other questionable plugins. Click Remove to delete these entries. Now you will see Reset Firefox to its default state message with Reset Firefox button. Click this button for several times and complete Istatic.eshopcomp.com removal. We strongly recommend you to complete these steps and see if the problem with Istatic.eshopcomp.com redirects persists. If so, reset default settings of your browser. Here, select Istatic.eshopcomp.com and other malicious plugins and select trash icon to delete these entries. Click Reset to confirm this action and complete Istatic.eshopcomp.com removal. Here, select Extensions and look for Istatic.eshopcomp.com or other suspicious entries. Click on the Uninstall button to get rid each of them. Here, look at the Homepage field. If it was altered by Istatic.eshopcomp.com, remove unwanted link and enter the one that you want to use for your searches. Remember to include the "http://" before typing in the address of the page. Now you will see a detailed dialog window filled with reset options. All of those options are usually checked, but you can specify which of them you want to reset. Click the Reset button to complete Istatic.eshopcomp.com removal process. ^ Olivia Morelli. What is adware and how to remove it?. NoVirus. Security and Spyware News, Removal Guides. ^ Matt Burgess. The Bad Rabbit malware was disguised as a Flash update. WIRED UK. Future Science, Culture & Technology News and Reviews. ^ Dieviren. Dieviren. Virus Removal Instructions, Cybersecurity News. This entry was posted on 2017-11-03 at 10:33 and is filed under Adware, Viruses. You can quickly scan the QR code with your mobile device and have Istatic.eshopcomp.com ads manual removal instructions right in your pocket. How did you remove Istatic.eshopcomp.com ads?